The use of maps as vehicles for communicating and reinforcing religious ideas dates from medieval mappamundi of the 7th century AD. They were "teaching rather than locational devices," intended "primarily to provide a visual narrative of Christian history cast in a geographical framework, not to communicate geographical or cosmographical facts." (Woodward 1985, 518, 519). While this map provides a reasonably accurate view of the world as known in 1681, it was intended primarily for religious education, bound (folded) into copies of English-language bibles and other religious works of the 17th and early 18th centuries (Shirley 1983, #457). The seven days of creation are illustrated in the panels at the top of the map. Below are the expulsion from Paradise, the Flood, the Tower of Babel, God speaking to Moses, the Ten Commandments, the Crucifixion and the Ascension. The voice of God is represented by Hebrew characters. Several significant biblical sites are shown by name on the map, but most significant locations (including Britain and everything in the Western Hemisphere) are identified by number with a key below. The map is centered on Eden. For a description of efforts to reassure the faithful by locating the site of Paradise, see Notes for ID #1014, Carte de la Situation du Paradise Terrestre, 1700. For other maps of Eden, see Subjects > Religion. Moxon's map was first produced in 1671|this state identifies Pennsylvania (key #57), which was chartered in 1681, and was produced the same year (Shirley 1983, 474). The map is dedicated to Gilbert Sheldon, Archbishop of Canterbury from 1663-1677 and bears his family's arms (on the right of the shield, with the three ducks) combined with those of the Archbishop. 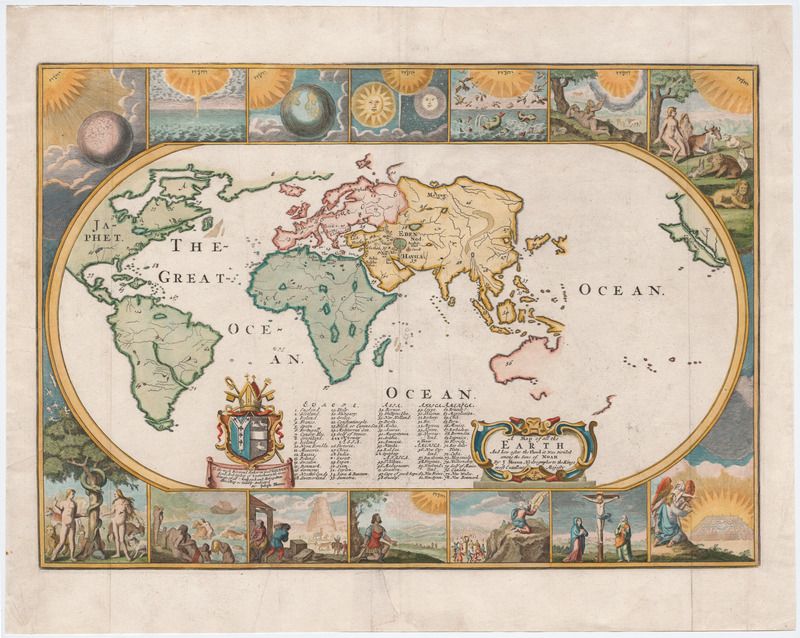 It's interesting to compare this with another world map intended for religious education more than 200 years later, ID #2085 (Genealogical Chronological and Geographical Chart).